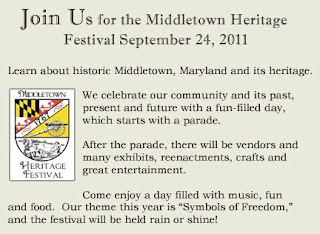 We are very excited to have been invited to be a vendor and participant at the Middletown Heritage Festival in Middletown, Maryland. 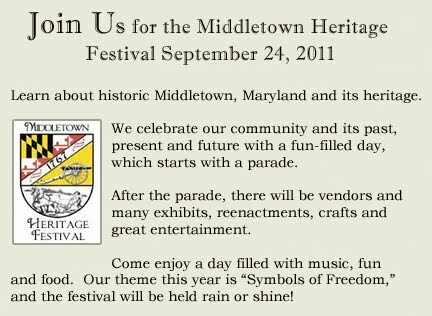 Each year the town of Middletown holds a large well attended festival to celebrate the town’s history. Our organization will be on hand for the celebration for the first time. We are looking forward to having our greyhounds present to meet and greet the public as well as to talk to people about greyhound adoption. This promises to be a wonderful opportunity to spread the word about greyhounds! Join us and thousands of others for this special event! We also have received a GREYT donation from the Hollow Creek Golf Course. They have donated two rounds of golf (and use of cart) for use any day Monday through Thursday. This package is valid until December 2013! We will be raffling this package off at the festival. If you love golf (or know someone who does), we are selling the tickets for $1 each or $5 for six. Contact Hettie at 301-416-2028 if you want to purchase tickets for this raffle (if you cannot make it to the festival). Remember, Christmas is just around the corner and this package may make a great gift for that golfer in your family! We hope to see you at the festival! For more details about this event, click on the title of this post.